Press releases were sent to local newspapers of towns which are featured in the ancestral stories, during the month of December 2014, which is the publishing release date when the hardcover edition of the book will be ready for shipping. The Author is available for print media and/or radio interviews, pre or post publishing release date. Please respect the privacy and security of the Author’s children when asking questions and/or taking still or video photography. Author retains right to final approval in writing of all media prior to final publication, for family privacy and security reasons. The Author is available for book signings free of charge for quantity book sales, within a 100 mile driving distance of Fort Morgan, Colorado. The Author is available for public speaking on a variety of topics covered in the book, pre or post publishing release date. Speaking fees will be waived for most non-profit or public service groups upon request, if travel expenses are covered by the host organization. All aspects of the book and website, including all writing and photos, are protected under copyright laws and are not to be used without written permission by the Author. • STRETCHED YET UNBROKEN is an inspirational Christian testimony; a simple but remarkable family history; a widow’s journey through her grief; and an all-around good read. • STRETCHED YET UNBROKEN is the unique love story of a Kansas lawyer’s daughter and a traveling oil man’s son who build an abundant life together while struggling to raise a large family in modern America. 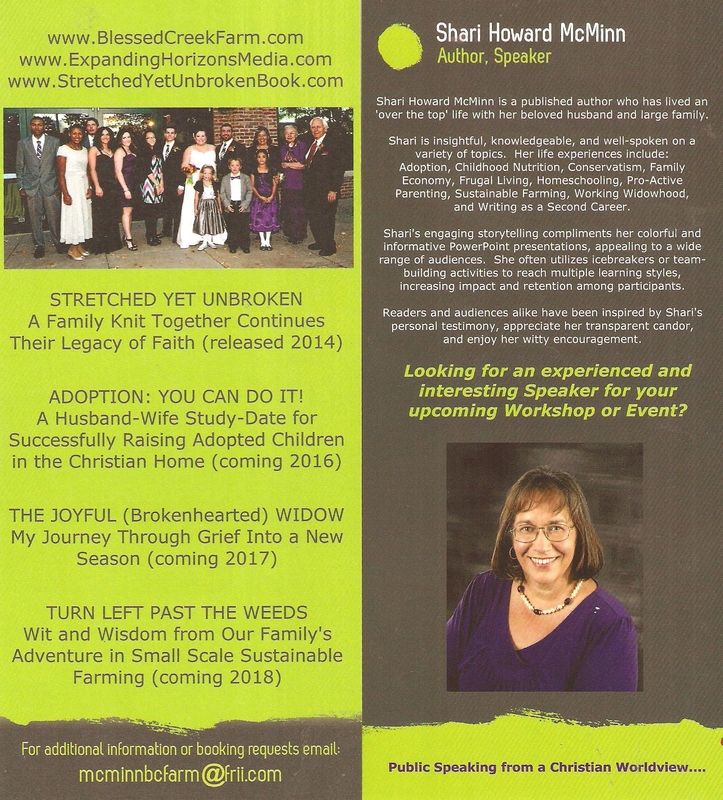 • STRETCHED YET UNBROKEN is a message of hope shared through the real life stories of a common family living an uncommon life. This fascinating and tenderly written memoir recounts the faithful, hard-working lives of five generations of Americans. Conservative values build strong families, and traditional family values are NOT dead. One can abundantly live the American dream of life, liberty, and the pursuit of happiness, upon a sure foundation of faith and family. Five generations of a loving, tightly knit family share their personal experiences of God’s faithfulness as He builds their legacy. +++Readers won’t want to miss out as author Shari Howard McMinn takes a step back to survey a full vista of lives well lived, starting with her family’s interesting roots. Working through her own recent tragedies, and culminating in the meaningful shared joy of life past, present, and future, her engaging memoir is filled with a lot of heart, a lot of laughs, and a lot of meaning to a generational legacy of faith. Written with her storyteller’s style that keeps the pages turning, she will have you laughing, sobbing, nodding with agreement, or a combination of all, and more! +++STRETCHED YET UNBROKEN is the real life story of how God takes ordinary people and works on them, and through them, in extraordinary ways. Sometimes His work is sudden and drastic, more often it is daily and gradually over the course of a lifetime. Throughout the connected generations, He shapes a sturdy people for His kingdom. In this multi-generational family memoir, Shari Howard McMinn relates the simplicity and excitement, the trials and triumphs, along with the tragedy and hilarity of an American family’s journey through the 1900’s into the present day.